Who among you remembers the legendary Oil of Olay Beauty Fluid? I do. I grew up watching my mom apply it on her face day and night. The sweet smelling pink fluid was an essential part of her facial routine. Here's a bit of trivia I learned from yesterday's Forever Olay event - Oil of Olay was created by a chemist for his wife. Isn't it sweet? 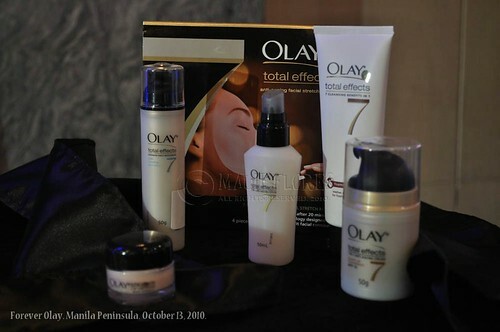 Essentials of the Olay Total Effects beauty regimen. In the 1950s, South African chemist Graham Wulff discovered that her wife used thick and greasy facial creams packed in shoe-polish style tins. Seeing this, he started to create the perfect cream that women like his wife Dinah would truly love. He developed a new facial moisturizer that could be quickly absorbed into the skin. With the help of his wife's suggestions, the Oil of Olay Beauty Fluid was born. Over the years, Olay became a trusted friend for women who want to look ageless and beautiful. I'd love to have all of these on my vanity counter! Paging the husband... haha! Olay still remains to be the trusted beauty product of most women. And just as Olay was born out of listening to a woman's need, Olay Total Effects was conceived from listening to the concerns of over 6,000 women across the globe. In 2000, the first black-and-gold bottle of Olay Total Effects was launched in the South East Asia region. In 2006, it reached Philippine shores and immediately gained the trust of Filipinas. 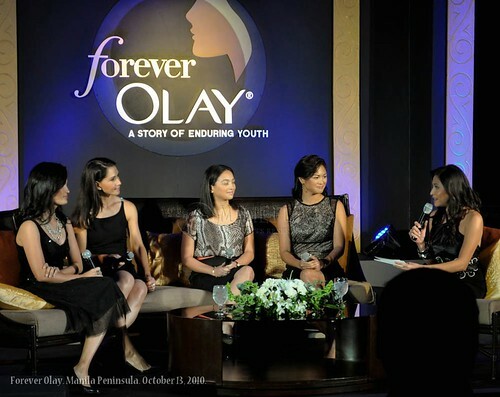 Proof that Olay Total Effects has lived up to its promise are the brand ambassadors that first launched the brand in 2006 - Miriam Quiambao, Dapphne Oseña-Paez, Ines Delgado-Prieto, and Menchu Launchengco-Yulo. These women have already undergone so much changes in their lives from the time they helped launch Olay Total Effects in 2006. Yet, they still look young and their skin remains as youthful as ever. That is why they all reaffirmed their promise to remain "Forever Olay." Olay Total Effects Ambasadors (from L-R): Daphne Oseña-Paez, Menchu Launchengco-Yulo, Ines Delgado-Prieto, and Miriam Quiambao. As you can see, Miriam Quiambao is as fresh and beautiful as the day she won 1st runner-up in Miss Universe. The Olay VISIA machine showed further proof that she continues to look even younger than most women her age, and even those 10 years younger than her. Visia is an in-depth complexion-analysis system used by Olay to study the skin conditions of different women and it records and tracks skin changes over time. Cleanse with Olay Total Effects Foaming Cleanser, Olay Total Effects Cream Cleanser, or Olay Total Effects Oily/Blemish Prone Cream Cleanser. Boost with Olay Total Effects Daily Serum, Olay Total Effects Night Cream, and Olay Total Effects Eye Cream. Moisturize with Olay Total Effects Normal Formula, Olay Total Effects Normal Formula with UV Protection, Olay Total Effects Gentle Formula, Olay Total Effects Gentle Formula with UV Protection, Olay Total Effects with Touch of Foundation, Olay Total Effects with Cooling Essense, or Olay Total Effects for Oily/Blemish-Prone Skin. Then once a week, use the Olay Total Effects mask and enjoy the revolutionary stretch technology that hugs the contours of your face. "Time can change ________________ but __________________ remains forever." Comment to this post and fill in the blanks with your answers. Include your name and email address. 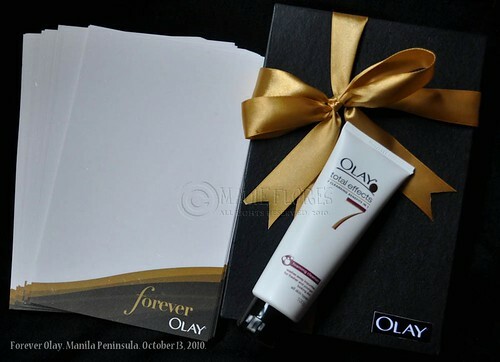 The best entry will win this Olay Total Effects Foaming Cleanser and the elegant Forever Olay stationery. The contest is open to Philippine readers and I will ship the prize to the winner. I will be accepting answers until 11:59 pm of October 22, 2010 only. "Time can change the texture and smoothness of our skin but with the help of Olay Total Effects our ageless beauty and radiant skin remains forever." "Time can change things but the memories remains forever". Time can change our body, mind and soul but what blessings we shared, showed grace, appreciated the beauty of life and true values imparted to others while we live remains forever. "Time can change outer beauty but outer beauty cared for by Olay Total Effects remains forever." Time can change our outer beauty and will eventually fade but a kind and loving deeds remains forever. Time can change people, place, and things, but the love of GOD still remains forever. Time can change the pigments, color, suffleness of our skin but the love of Olay for mproving/delaying our skin problems remains forever. Time can change your perception of what really beauty is but the love for one's beauty remains forever. "Time can change everything and anything but changes remains forever." "Time can change our physical appearance but the beauty inside remains forever." Time can change our youth with each year passing and each number adding, but each person's youthfulness and child-like wonder remains forever. "Time can change people but lasting impressions remain forever." "Time can change everything but memories of love remains forever." Congrats, Robelle! 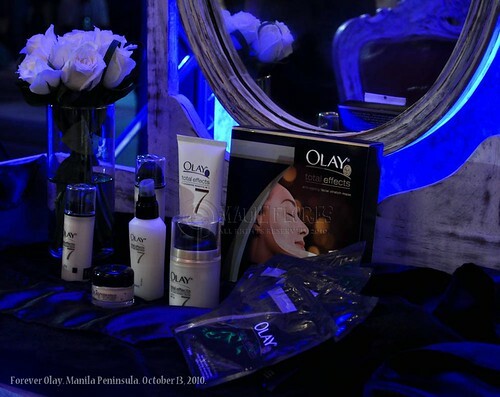 You win the Olay Total Effects Foaming Cleanser and Forever Olay stationery.